There have been some starts and stops in the build, mostly as I try to figure out ways around my errors and choices, yet the build is going strong. I have the basic sleeping platform and table built and it works well. This is step two in the micro camper build and when it is finished, I’ll compile all the steps and posts into one long tutorial. Step 1 can be found here. 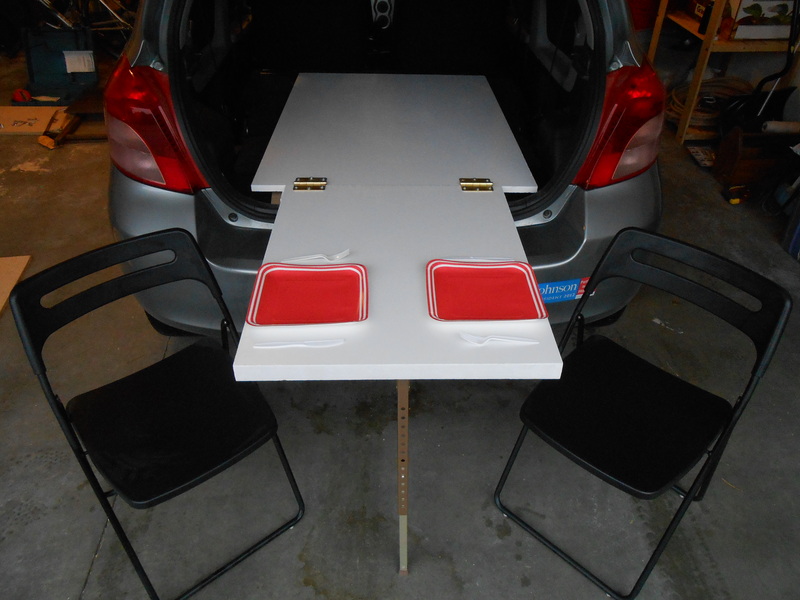 In step one, I cut 2 pieces of chip board* – a 32 inch by 48 inch piece in the back of the car and a 24 inch by 30 inch piece to fold out of the car so I can extend my legs when I sleep. There’s a raised lip on the hatch opening of the Yaris, so I’ll glue a third strip of wood to the bottom of of the larger main piece of the platform so the platform lays level and is supported. Otherwise, when I fold the leg platform out, the hinges will rip off. I used wood putty to patch up any rough edges or chips or holes in the top of the wood, then painted all the wood with 3 coats of outdoor rated white paint. I could have sealed it with poly, and may still do so for the table top, but it didn’t appear to require it. 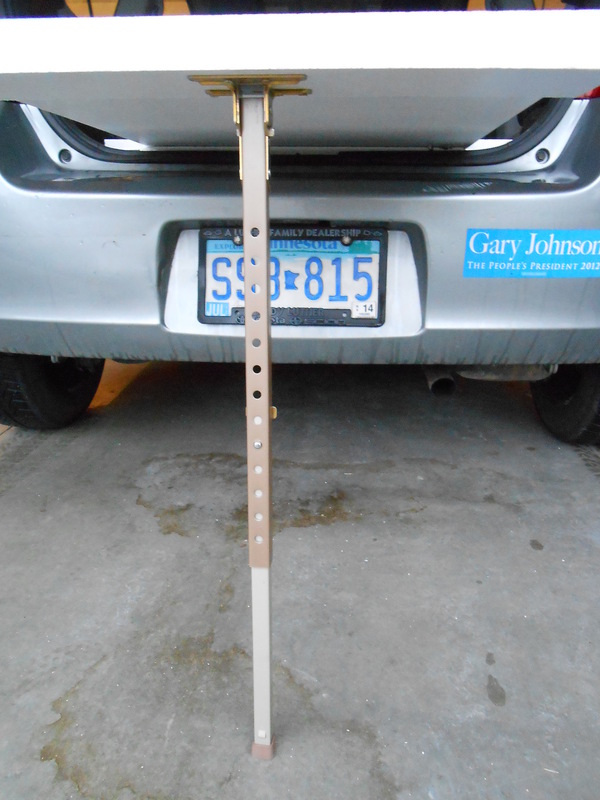 After that, I attached the telescoping, folding leg. It’s important to have a telescoping leg so your table/leg portion of the sleeping platform is supported even when you are on uneven ground. I went with one leg in the middle, you could go with two legs in the corners, that’s up to you. The leg cost about $22 through Amazon. 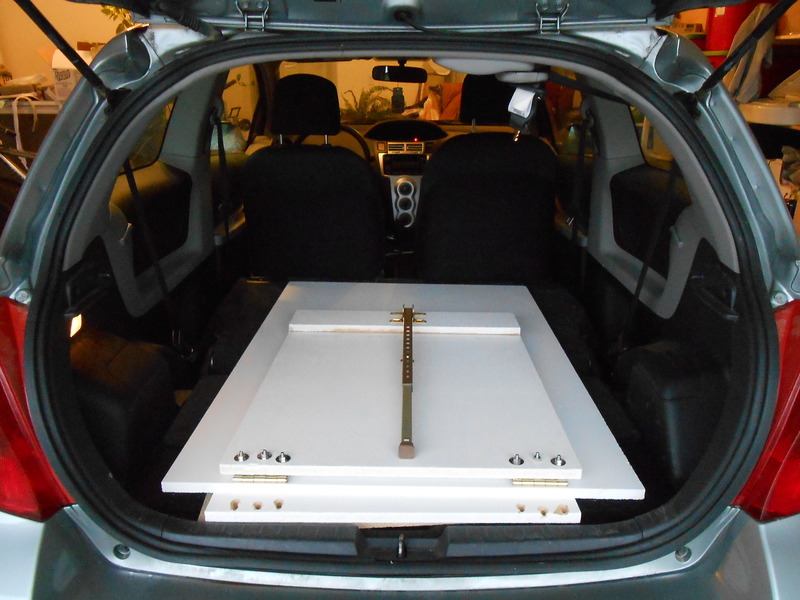 When the table/bed are not in use and it’s time to hit the road, it all folds flat into the back of my car. You’ll notice in the photo below that there are small holes dug into the small board under the two main platform pieces. 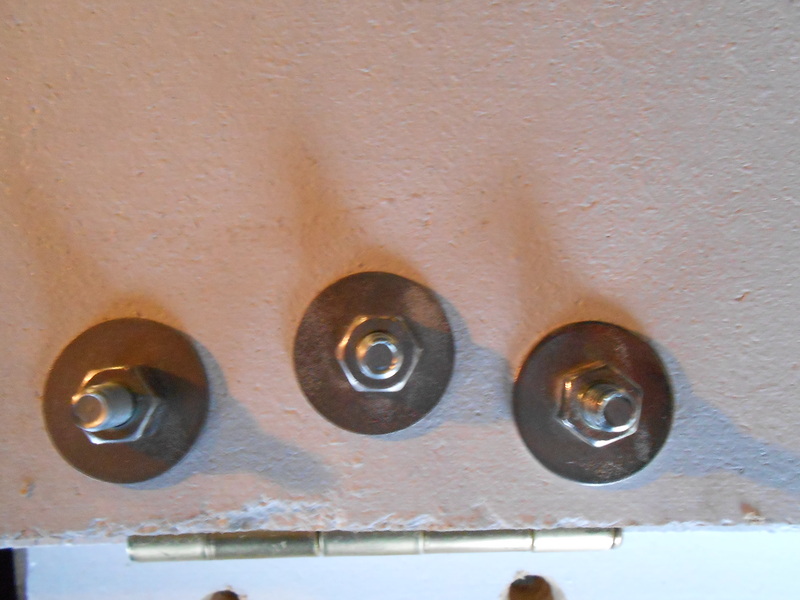 This is so the bolts can sink down into the board when the platform is folded out. I’ll putty, smooth, and paint those so they are sealed up. Chip board needs to be 100% sealed or it will swell in damp or wet conditions. Step three involves putting a headboard onto the front of the sleeping platform. That’s not something I had originally designed as part of this build, but after laying on the platform I realized how convenient it would be. And it’ll keep my pillows from sliding off the end. * I used chip board because it was 1/3 the cost of solid wood and 1/2 the cost of plywood. There are pros and cons to using chip board. The pros are mainly cost. The cons are: not as smooth, you need to use nuts & bolts rather than screws because screws don’t hold well in chip board, swells more in damp/wet conditions.